The Salvation Army Adult Rehabilitation Center serves as a haven for men who have a sincere desire to lift themselves from the bottom of their addictions. At the Buffalo Adult Rehabilitation Center, we believe anyone can change if they are willing, open and accepting of the program. 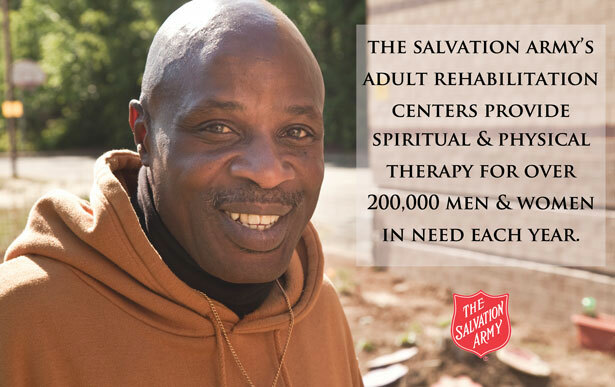 People come to The Salvation Army's Adult Rehabilitation Center to receive treatment for a myriad of issues. The goal of the staff is to rehabilitate the entire individual. The staff begins by supplying each resident with the basic essentials, such as clothing, hygiene products, health care, safe and sober living accommodations, and three meals a day served in our dining room. Each individual who enters the program is assigned a counselor to determine if they are in need of outside mental health services and treatment from another local agency. Small group discussions, education, emotional management classes, relapse prevention, alcoholics anonymous, narcotics anonymous, twelve step meetings, and HIV testing are all available to residents. While in the program, residents participate in work therapy which allows individuals to learn life skills while developing self-worth and value. The Salvation Army believes in ministering to the "whole" person. Spiritual regeneration is one of the most important components of the program. Bible study is held each Wednesday with a contemporary chapel service following. Daily devotions, spiritual classes, spiritual retreat and pastoral counseling are all aspects of the program as well. A Sunday worship service is held each week. For more information, please call (716) 875-2533.